Note: This product is not suitable for archival storage. 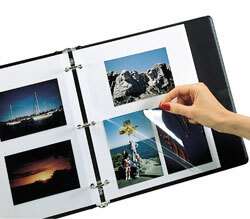 There is no better way to store memorable photos then by creating an album to display the images. These mounting sheets make it possible to use a variety of photo sizes, while accommodating different orientations in order to customize each page. Mount your photographs for storage in three-ring binders. It's easy: Pull back see-through plastic, press photo onto adhesive sheet (reposition as necessary), and apply plastic for secure protection. Overall size: 11 x 9. 50/BX Note: This product is not suitable for archival storage. Hi. I'm John at C-Line and today we're going to talk about our Redi-Mount Photo Sheets. How many of us have a box full of photos sitting in our closet? Wouldn't it be nice to display and organize your photos in three-ring binders to be enjoyed by everyone? C-Line's Redi-Mount Photo Sheets are the perfect solution. Simply pull back the see through plastic, press your photo onto the adhesive sheet, reposition as necessary, and apply the plastic overlay for secure protection. These photo-mounting pages fit in standard three-ring binders and provide a simple solution for organizing your photos by orientation or size. Say goodbye to photos with bent corners and fingerprints sitting in a box and start organizing your photo albums with C-Line's Redi-Mount Photo Sheets. Order yours now! That's all we have for today. I'm John at C-Line. Thanks for watching.